As a fan of movies, January is usually one of the lowest points of the year. Notorious as a time where box-office flops are released into theatres to try to make a profit from movie-goers who have already seen the last big films released in the previous year. Insidious: The Final Key, which is the fourth film in the series is one of those films and while it’s not bad , it’s also not one to rush out to see. Series protagonist and parapsychologist Elise Rainer (Lin Shayne) gets a call from a man who is experiencing paranormal events in his house and begs for her help. At first she denies the request when she realizes that he is living in her childhood home where she first learned of her abilities to communicate with the dead, and accidently summoned a powerful spirit. Eventually she travels back along with her paranormal research partners Specs and Tucker (Leigh Whannell and Angus Sampson) where they investigate the current haunting while also trying to stop the spirit Elise let out as a child. While there are a few sequences that genuinely instill dread in the audience, the main problem is that Insidious: The Final Key isn’t scary. Instead of subtle moments that add to the horror to the situation that the characters find themselves in, the movie goes the route of other bigger budget horror films by tossing jump scares out, which are accompanied by a loud, almost metallic noise. Not even the main villain of the film, Keyface is scary, nor is he in the film that often. 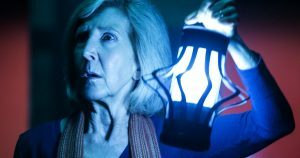 Insidious: The Final Key continues to use cheap jump-scares as a replacement for legitimate horror. The story is fairly generic and is forgettable. It is like any other haunted house film such as Paranormal Activity and comes off as lazy. When the main characters reach Elise’s old home nothing really happens or progresses for what feels like a good 20 minutes or so, and the sense of urgency doesn’t exist until the final act of the film. The story is also filled with coincidences that only exist to push the plot forward. As an example, a character that is barely in the film and that barely has any lines is revealed to have the same kind of powers as Elise, and can use them as well as her, despite never attempting to do some of the actions that Elise has been doing for decades. Elise’s childhood home gets tiring to look at, as it’s the setting where the vast majority of the movie takes place. There isn’t anything interesting stylistically in the décor despite signs of age and decay in the house as the movie jumps between past and present. Later in the film, the setting moves toward the ghost realm called “The Further” and even those sets aren’t visually striking. They feel like any kind of derelict building in any generic horror film, but with some smoke machines covering the floors. The film is salvaged however with the performances of the main characters. Shayne’s performance as Elise carries the film at multiple points and the arc of her character is the strongest of all the other characters. While sometimes annoying and unnecessary, Whannell and Sampson’s comedic performances as Specs and Tucker are fun to watch and provide a refreshing contrast to the bland horror. Insidious: The Final Key is a serviceable sequel that seemingly ends the series as it began in the first film. Fans of the series will most likely enjoy it, however it still does nothing new to make the audience feel afraid of the dark.